"I am 13 years now. For many years I have had episodes of poison oak rashes several times a year. The reactions seemed to be getting worse and worse each time. In June of 1999 it was particularly terrible: I had gigantic boils over my arms. It was even in my mouth. I was sick to my stomach. My grandmother, who is familiar with Dr. Z's work, took me to see Dr. Z. After only two NAET treatments my poison oak rash disappeared. I have not had any episodes of poison oak during the last 18 months. 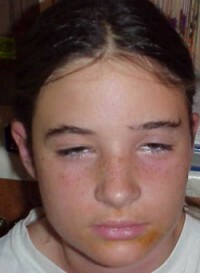 This is what Brittney looked like when she came to see Dr. Z on July 1, 1999. Her face so swollen she could hardly see out of her eyes. It took merely two NAET treatments. Her rashes and swelling disappeared. She has had no further reactions to poison oak. NAET (Nambudripad's Allergy Elimination Technique) is a revolutionary treatment system based on the principles of Chiropractic Neurology, Acupuncture, and Applied Kinesiology (Muscle Response Testing). It was developed by Dr. Devi Nambudripad of Buena Park, California. This treatment, in conjunction with Chiropractic adjustments and/or biochemical-nutritional support, can bring about dramatic improvement -at times even total elimination- for all types of allergies. It is simple, non-invasive and extremely effective. It is currently practiced by over 600 health practitioners, including MD's, nurses, acupuncturists, chiropractors, dentists, and, to some extent, allergy sufferers themselves. NAET is based on the recognition that all things, animate and inanimate, in our universe have their own specific electromagnetic fields due to their atomic and molecular makeup, and that these fields affect each other. This is true for our bodies, rocks, pollen, mold, peanut butter, a flower, water, in short, everything. This electromagnetic energy is associated with meridians (energy pathways) in acupuncture, chi in Chinese Medicine, and can be demonstrated with Kirlian photography. Nuclear physicists can determine the type of atom by its electromagnetic frequency. According to Dr. Devi Nambudripad, this is what happens: Your energy system and brain interpret a particular substance (a diamond ring, a whole wheat bagel, a peanut, hot water, sun light) as potentially harmful to your body, and your body reacts. For other people this same item is totally harmless. Your energy pathways freeze up as a way of defending the body against this unsuitable substance. This in turn blocks your energy meridians and, if this condition continues, the overall functioning of your body suffers. Our fingertips are very sensitive to the electromagnetic energy of substances with which we come into contact. By placing a sample of a suspected allergen into a person's hand, and using Applied Kinesiology muscle testing, the NAET practitioner can determine whether or not a person reacts "weak" or "strong" to the substance, i.e., whether this substance causes a energy blockage in the patient's body. Such blockages can cause a wide variety of symptoms, from sneezing and coughing to chronic diseases such as asthma. The NAET practitioner stimulates key points along the patient's spine while the patient is holding the allergen. In addition, Dr. Z stimulates certain meridian points with a Low Level Laser. A chemical change takes place in the autonomic nervous system, neutralizing any allergic reaction to the substance. NAET reprograms the brain and the nervous system, and eliminates your body's conditioned response to the "allergen". Environmental medicine has been dealing with hidden allergies for several decades. You try to avoid the allergenic substance in your life, you go on a rotation diet, and maybe you can manage. But with NAET you can continue to have contact with the very substance that made you sick. For an in depth allergy evaluation contact Dr. Z!